Demolition is an essential part of a number of renovation projects. However, the process can be dangerous, frustrating, and expensive. If it's not done right, it can nip your whole renovation project in the bud. Approach demolition with the mindset that it is a project all on its own, not merely the prelude to the "real" project of renovating. There are people who do nothing but demolition, you should take the same kind of professional approach to doing the work yourself. Think of yourself as wearing a "demo" hat for a while, and don't rush the project. When demolition is completely done and cleanup is complete, you can proceed to renovation. All too many remodeling projects run into problems when the demolition phase trickles over into the construction phase, and it often leads to wasted effort. First things first: Make sure electricity and water have been turned off to the demo area to ensure your safety. That last thing you want is to cut into live electrical wires or punch into a pressurized water supply pipe. If you need light, run an extension cord from another room and illuminate the room with a utility light. Once electricity and water supply have been shut off, taken move to getting both yourself and the area ready for demo. Get the right tools: Just as you carefully select a drill or a saw for a construction project, you need to select proper tools for your destruction project. Have at least a sledgehammer, a crowbar (the big kind), a prybar (the flat, hand-held tool), and a claw hammer that you don't particularly care about (it will get dinged up and may even break). A reciprocating saw is necessary for most major demolition jobs. For floor or roofing demolition, a demo fork can make it much easier to pry up materials. A wheelbarrow for hauling debris to the dumpster is essential. Wear the right outfit: This isn't about fashion, but rather about safety. Wear thick-soled boots to avoid stepping on nails and screws. You can buy disposable paper coveralls to put over your clothes if you're doing something extremely dirty such as tearing out a ceiling. If you are doing floor demolition or other work that involves hands-and-knees, a good pair of knee pads will work wonders. If you'll be doing a lot of heavy work and lifting, a back support belt will ease your fatigue. Wear a sturdy plastic hard hat whenever working overhead. Seal off the demo area: If there is an opening anywhere, drywall and plaster dust will find it and drift into other areas of the home. Merely closing a door on demo usually isn't good enough. Seal openings with sheets of plastic, and secure them in place with blue tape or use a ready-made system like the Zipwall Dust Barrier. Make sure to also cover up air ducts and cold air returns, because an enormous amount of dust can be distributed all over your house by the forced air HVAC system. Rent a dumpster: Rather than making multiple trips to a landfill, rent a roll-off dumpster and park it where you have easy access. A dumpster with a drop-gate is a good idea, as it makes it easy to fill it with debris by wheelbarrow. Use a respirator or dust mask. A HEPA respirator is best if you're kicking up dust in an old house, because asbestos, lead-based paint, or other hazards could be in that debris. If you can't stand wearing a respirator or feel certain you're not dealing with hazardous materials, at least use a dust mask that will filter out most particles. Learn what's lies beneath (or behind). Before swinging that sledge or crowbar, try to determine what is behind that wall. Live electrical wires? Water pipe? Gas lines? Asbestos? Exploratory holes, stud finders, and flashlights work wonders at helping you find out what's in there—but until you know for sure, always assume that there's a live electrical wire behind the surfaces. Clean as you go. If you're doing a demo project of any real scale, it's worth every penny to rent a rolloff dumpster bin. This can save you from multiple trips to the landfill. Even if you have been cleaning up as you go, demolition is messy job. Finish up the project before you start the renovation process by hiring a hauling service. These are less cost-effective than the rolloff, but good for demo projects smaller than a rolloff. For instance, if you're tearing out a small- to medium-size bathroom, you may want to just dump everything on the back patio and have the hauling company deal with it. Finally, completely sweep and vacuum the work area. It is best to start with a completely clean slate as you move into active construction. Even a quick damp mopping is a good idea. 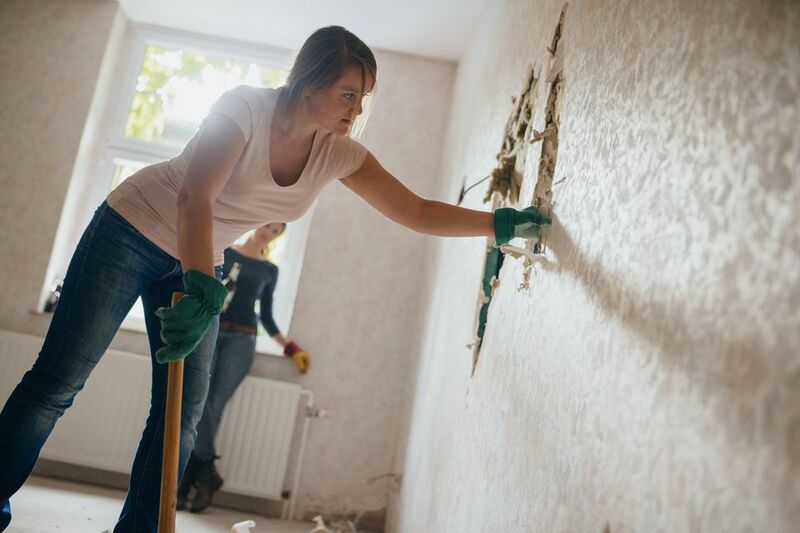 The remodeling construction that comes next, will, of course, generate its own dust and debris, but try to make opened wall cavities and subfloors as clean as possible before sealing them up with drywall or flooring. Especially if you have family members with asthma or allergy issues, the less dust that ends up sealed inside wall cavities, the happier and healthier they will be. What is the Correct Way to Break up Concrete by Hand? Know The Best Way To Pay For That Big Remodel?